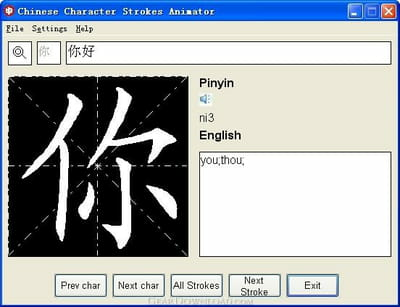 Chinese Character Stroke Order Animator is for learning Chinese spelling as knowing how to read and speak Chinese are not enough nowadays. Approaches : the pedagogical way adopted is by showing the exact way to write Chinese character followed by all Pynin character. The Pynin character is with real human pronunciation that is very helpful for better listening and speaking improvement. An easy to use interface that helps users see what are the tasks they want to perform with the computer. In addition to that, there are other possibilities like using simplified Chinese version, Traditional Chinese, English. Explanation : for better understanding of the lessons, there are English explanations next to each word so that the users could acquire new vocabularies and get the exact meaning of the word displayed on the computer screen. Customization : users can create their own text files concerning the words they learn from each sessions. That way, there is a possibility for some review from time to time or to print for personal use. Safety : the software is free of malicious threats that could harm or contaminate the computer while downloading. A powerful shareware that makes learning Chinese spelling faster and more interesting. Latest update on November 20, 2016 at 04:54 PM.